Given your new understanding of economic concepts, let’s revisit the example at the beginning of this module: the experience of taking a flight and feeling like others have special privileges that you don’t have. In our example, you waited in line at the security checkpoint for much longer than those who went through the express line. Let’s assume that you waited in line for one hour and 10 minutes, while those with express access were able to get through security in just 10 minutes. What is the cost of one hour of your time? What is the cost of a ticket that gets you into the the express lane? Did you make the right choice? Let’s return to the concept of opportunity cost. Remember, opportunity cost indicates what must be given up to obtain something that’s desired. You chose to wait in line rather than buying a ticket that would allow you to use the express lane. It may not have seemed like a choice, but you did choose to buy a less expensive ticket—instead of paying more for one would have gotten you into the express line. How much more money would you have to pay for that ticket? In other words, you chose to wait in line for one hour in order to save the $329 that you would have had to spend for a business select ticket. When we think of this in terms of opportunity cost, you now have some way to measure your decision: you have a firm number that can be compared against the cost of an alternative. Let’s consider monetary costs alone. If you had worked at a job for one more hour—instead of waiting in the security line—you could have earned an additional $20. That choice would have meant earning more money, but you would have had to spend far more for a business select ticket than you made in an hour. Since the $329 cost of that ticket is so much greater than the $20 you might have earned, the decision to wait in line for an hour (as opposed to working one hour more) makes good sense when comparing the monetary cost. But remember, opportunity cost is the value of the next best alternative, and there are likely ways that you spend your time that you value more than money. Perhaps getting through security more quickly will enable you to sit down in a quiet café, enjoy a cup of tea, and avoid the stress you feel when you are rushed. There is a real value that you have given up. Or, what if you are struggling to stay caught up on your schoolwork and an hour of study makes the difference between getting a good grade on an important test or not? If it’s a test that has a big impact on your grade or academic record, then an hour might be incredibly valuable. In other words, for any individual, the opportunity cost may simply be the lost money from work, or it may be peace of mind, or it may be an hour of study time—or something altogether different. Whichever one of the alternatives has the greatest value to you is your opportunity cost for one hour in line. Does It Ever Make Sense to Buy Time? Obviously an hour of time has a different opportunity cost for every individual. 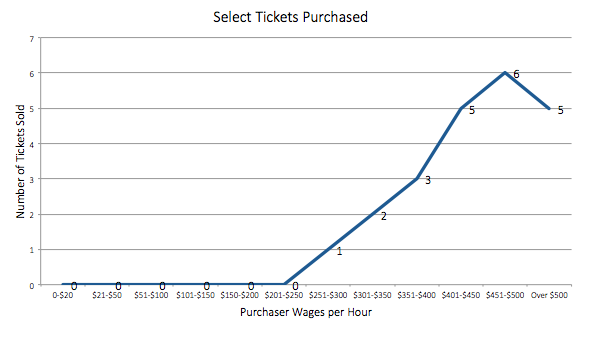 Let’s take a minute to look at a graph of hourly wages and see if it helps us think about the opportunity cost. On any flight, passengers with a higher hourly wage are more likely to purchase a select ticket that permits them to bypass security lines and board early. For some groups of passengers, the time is more valuable than the money. Still, you will note that some passengers are willing to spend more than their hourly wage to avoid waiting in line. The definition of opportunity cost is quite specific: it’s the value of the next best alternative. However, every individual values time, money, convenience, peace of mind, and other factors differently.